Schools have been shut in Singapore and free masks are being distributed as the island-country grapples with thick smoky haze and high levels of pollution. According to Press TV, officials ordered all primary and secondary schools to be closed on Friday while the vulnerable were directed to the community centers across the island where they could receive free masks. Volunteers also went house to house to give out the masks to those unable to come to the centers. The fog-resembling haze, a pall of grayness that obliterates the skyline and seeps inside homes, emerges each year as forests in neighboring Indonesia are burned for farming and plantations. The smoke poses serious health hazards to children and the elderly and those with breathing problems. The Pollutant Standards Index (PSI), which measures air pollution in the country, hit the highest recorded since the start of 2015 on Friday for a three-hour period. 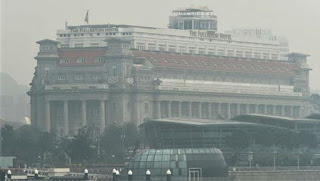 The haze has also caused tensions between Singapore and Indonesia, with Singapore’s Foreign Minister K. Shanmugam accusing Indonesian officials of having no regard for the health of the people in the two countries.